This Gay Teacher Is Starting Small…With Google. Sparking bravery one video at a time. Once afraid of letting his students know he was gay, Joel Carlovsky (The Super Brave Teacher) now wants the world (and Google) to know that he is out and proud. How do you tip the world in a radically positive and accepting way for all LGBTQ+ teachers and students? That’s why I started with Google and YouTube. Yes, dear readers and fellow accomplices, I am on a mission to tip Google and YouTube in a radically positive and accepting way for all LGBTQ+ teachers and students. You might be wondering: Why? Isn’t it already getting better? And why something so mammoth as tipping Google and YouTube? I hear you. I hear your questions. I hear your doubts. Please, hear my story. I am a Kindergarten Spanish Immersion Teacher in Minnesota. And not only that. I am an out and proud gay teacher. As a gay teacher in Minnesota, I am protected by state law. I can be out and proud. I can be 100% me. You might not like it. You might not get it. You might rock some gay microaggressions or passive aggression my way. But as a gay teacher in Minnesota, I am protected. Being “safe” is not enough. Being “protected” does not tip the world in a radically positive and accepting way for all LGBTQ+ teachers and students. I call myself the Super Brave Teacher. I call my classroom the Super Brave Room. That makes my 21 kindergarten students our Super Brave Students. As a kindergartener, my students rarely overthink me being gay. They know I am married to my husband. They know that we are all different and that that is not only okay but also amazing and worth it. They know I like rainbows. They know that I love them and think the world of them. They know that I will do anything for them to be their bravest, most genuine self. But being super and brave in my microcosm of a classroom is not enough. Being super and brave does not make it better today for all LGBTQ+ teachers and students. So, I had an idea this summer. (As you can imagine, all great ideas come to teachers in the summer!) I would start a new YouTube channel. Yes, I was proud of my Kindergarten Spanish Immersion channel. But I was antsy to start something new. What could it be? A Super Brain Dances for Super Kids channel? A Super Teacher Helps Super Anxious Parents channel? A Super Mindfulness for Super Kids channel? I found very few uplifting stories of fellow LGBTQ+ teachers sharing their proud stories of visibility and equality. Then, I thought of our students. Try imagining this scenario. A student hears that I am a “gay teacher.” That student then Googles or YouTubes “gay teacher.” That student finds what Google and YouTube’s algorithms suggest for “gay teacher.” That student then associates “losing job,” “predator,” or “sexual fantasy/kink” with me. That same summer day, I decided to start the Super Brave Teacher YouTube channel. I did not feel super or brave, but I knew that I did not have to wait to start doing super and brave things. I did not have to wait to start making it better for all LGBTQ+ teachers and students. I proudly uploaded my first video. I proudly started filming and uploading at least three videos a week – making sure to include “gay teacher” in the titles, descriptions, and tags. I proudly tagged all of my previous YouTube videos with “gay teacher” and added “gay teacher” in all the description boxes. I designed the Super Brave Teacher website (www.thesuperbraveteacher.com), Instagram account (@thesuperbraveteacher) and Twitter account (@proudgayteacher). Over 50 videos later, I am the #1 channel search for “gay teacher.” I am on the first pages of YouTube’s and Google’s video searches. It is hard and lonely at times. (What? Only 53 views?!) But I am not alone. And I will never be alone. You are not alone. And you will never be alone. I invite you to spark bravery with me. I ask you to make it better today for all LGBTQ+ teachers and students. Shift the narrative with me by visiting the Super Brave Teacher YouTube channel. Click on the videos. Share the videos. Like the videos. Tweet the videos. Talk to your friends, family, and community about the videos. Do whatever you do to get the word out. Let’s show the “little guys” like Google and YouTube that LGBTQ+ teachers and students need more visibility, voice, and platforms. But we can’t stop there. Yes, I want you to get the Super Brave Teacher word out. But, we need more super brave stories. If we are going to tip these giants in a radically positive and accepting way, Google and YouTube need to see that there are millions of out and proud LGBTQ+ teachers and students around the globe. Yes, it is getting better. I hear you. I hear that. Thank you for hearing me, dear readers and fellow accomplices. Thank you for hearing that we can’t wait. Thank you for hearing that we need to make it better today one click and search at a time. Joel Carlovsky is a Kindergarten Spanish Immersion Teacher in Minnesota. He has been teaching internationally and in the States for over ten years. He lives in Minneapolis with the best guy he knows - his husband, Mark. 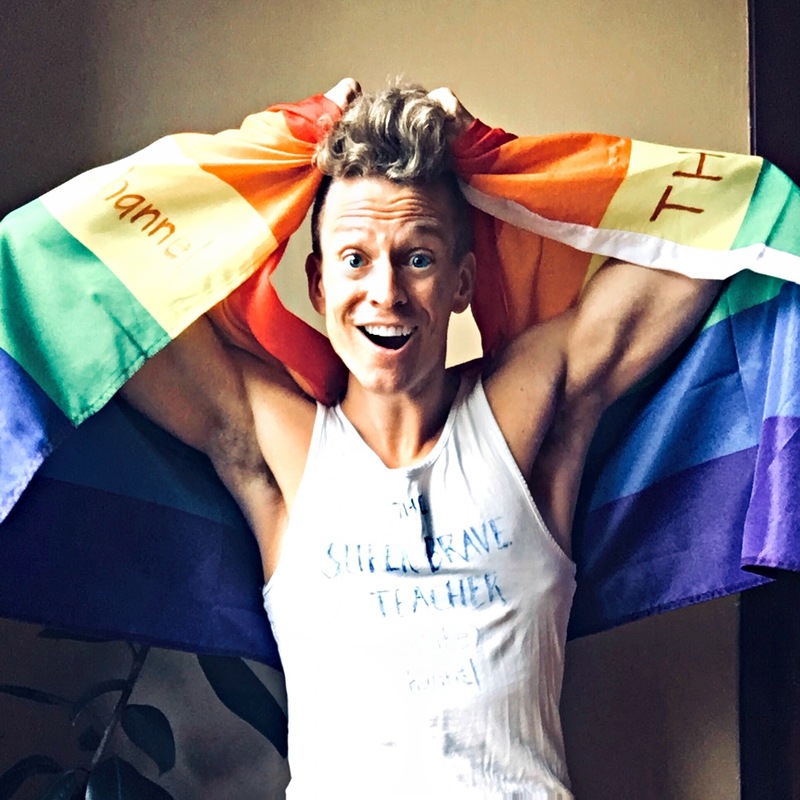 Once very afraid of being out and proud in any facet of life, Joel is now on a mission as the Super Brave Teacher to spark bravery in others and to make it better today by sharing his story and those of other Super Brave LGBTQ+ teachers, students, and fellow “accomplices.” He is currently writing “the teacher book that doesn’t exist,” working to shift the narrative with his Super Brave Teacher YouTube channel and being extra gentle on himself in the process.